The joke about children figuring out how to set up TiVo better than their parents can be funny -- until it's downright frustrating. 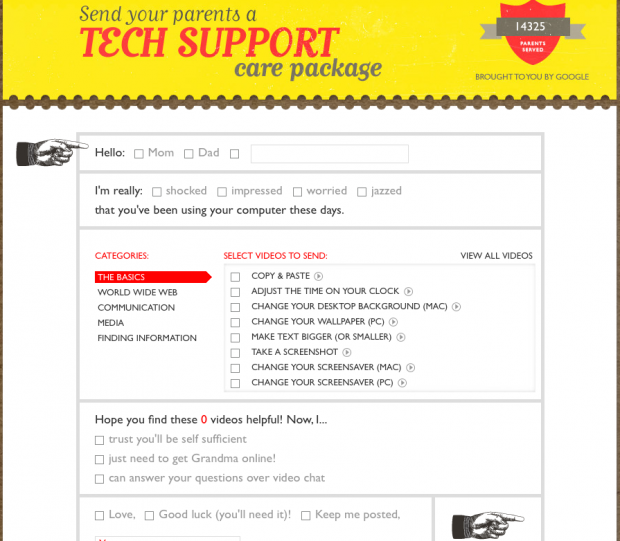 For all of us who've had to walk through the fraught process of helping our parents set up e-mail accounts, send videos, search for information, or even change the desktop image, Google has set up a tech support of sorts for digital non-natives. Instructional videos on Teachparentstech.org (a Google site) patiently and kindly show learners a range of important life skills, everything from finding a pizza restaurant nearby to cropping and sharing photos to setting up video chats. Here's Kind Katie showing us how to find movie times online.